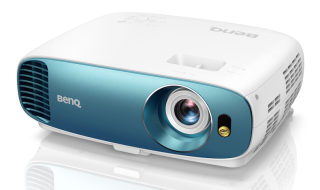 BenQ announces £1200 4K HDR projector | What Hi-Fi? It enters the fledgling 4K HDR midrange projector market as one of the most affordable models around. Despite the startling reduction of 4K HDR TV prices in recent years, the slope has been a lot gentler for projectors. Still, Optoma’s £3000 UHD65 impressed our eyes enough last summer to win a 2017 What Hi-Fi? Award, and a recent flurry of sub-£2000 4K HDR projector announcements (such as Optoma’s forthcoming £1500 UHD40 and two ViewSonic models for “under €1300”) suggests the video technologies have now firmly infiltrated the midrange market. BenQ recently joined the charge with its W1700 (£1700), and soon the 4K HDR TK800 will sit beneath it. Available next month and priced at £1199, it boasts 3000 lumens of brightness (plenty for a well-lit room), 3D and HDR10 support, and claims to cover 92% of the Rec. 709 colour space. With a throw ratio of 1.47 - 1.76 the TK800 can, for example, beam a 100in image from 3.25m. The maximum image it's capable of delivering is 300 inches. Arriving just in the time for the FIFA World Cup and marketed as being for "immersive live sports", the TK800 has dedicated ‘Football’ and ‘Sport’ modes which aim to (for example) intensify green grass and keep skin tones natural, while boosting the clarity of the commentary and crowd. The TK800’s has a new 5-watt CinemaMaster Audio+ 2 sound system, as well as auto keystone correction and 1.2x zoom for flexible set-up.